Reason: for announcing plans to reform police stop-and-search in England and Wales. Home Secretary Theresa May has featured in this series twice before: once as a Hero (for her decision not to extradite Gary McKinnon to the US) and once as a Villain (for supporting minimum alcohol pricing). 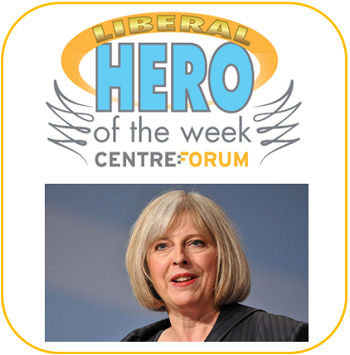 The balance has tipped in favour of Hero status this week thanks to her plans to reform police stop-and-search in England and Wales, and her announcement that officers who fail to use their powers properly will face disciplinary action or retraining. She has good reason to do so. The findings of Her Majesty’s Inspectorate of Constabulary (HMIC) show that 27% of the stop-and-search records it examined did not contain reasonable grounds to search people, even though many of these records had been endorsed by supervising officers. That suggests more than one-quarter of the million-plus stops carried out under the Police and Criminal Evidence Act 1984 in 2013 could have been illegal. Unsurprisingly, but still depressingly, those who are black or from a minority ethnic background are up to six times more likely to be stopped and searched by the police. No single issue has done more to poison relationships between young people in inner cities and the police. Unless you have a young male family member who is repeatedly stopped and searched, it is difficult to appreciate the bitterness it causes. I want to make myself absolutely clear: if the numbers do not come down, if stop-and-search does not become more targeted, if those stop-to-arrest ratios do not improve considerably, the Government will return with primary legislation to make those things happen, because nobody wins when stop-and-search is misapplied. It is a waste of police time. It is unfair, especially to young, black men. It is bad for public confidence in the police. That is why these are the right reforms and why I commend this statement to the House. And that’s why she’s commended here this week.